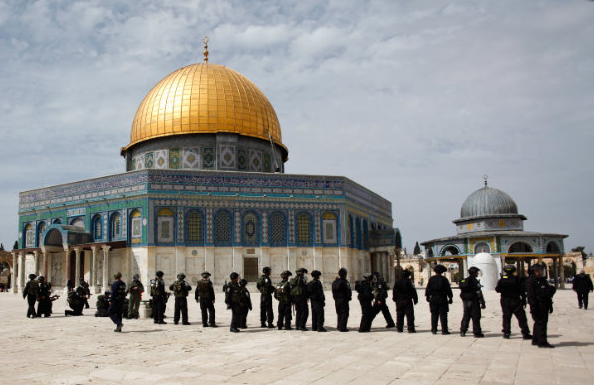 The conflict over the Temple Mount is a clear manifestation of Islamic replacement theology, a noted archaeologist told the Knesset on Wednesday. It is the site’s holy status in Judaism that is the basis of Islam’s interest, and this phenomenon has been seen throughout history, with Islam appropriating major Christian sites as well. Asaf Avraham, former director of the Jerusalem Walls National Park of the Parks Authority, addressed the newly formed Temple Mount Heritage Foundation headed by Rabbi Yehudah Glick (Likud) and Shulamit Mualem-Rafaeli (Jewish Home). Avraham explained that the Islamic connection to the gold-capped Dome of the Rock, and indeed the entire Temple Mount Compound, is based on the sanctity of the Jewish Temple that previously stood on the site. Avraham based his claim on thousand-year-old Arabic writings he discovered in the Muslim village of Nuva, located next to Hebron. The writings refer to Sachrat Beit El Maqdis, which translates to ‘Rock of the Holy Temple’. “This was one of the names of the Dome of the Rock in early Islam,” Avraham explained in an interview with Arutz Sheva. “This is of the evidence from early Muslim literature which defines the Dome of the Rock as Beit El Maqdis (Beit Hamikdash – ‘Temple’ in Hebrew)”. Avraham’s claim stands in direct contradiction to UNESCO resolutions passed last summer which effectively erased any connection between Judaism and its holiest site.